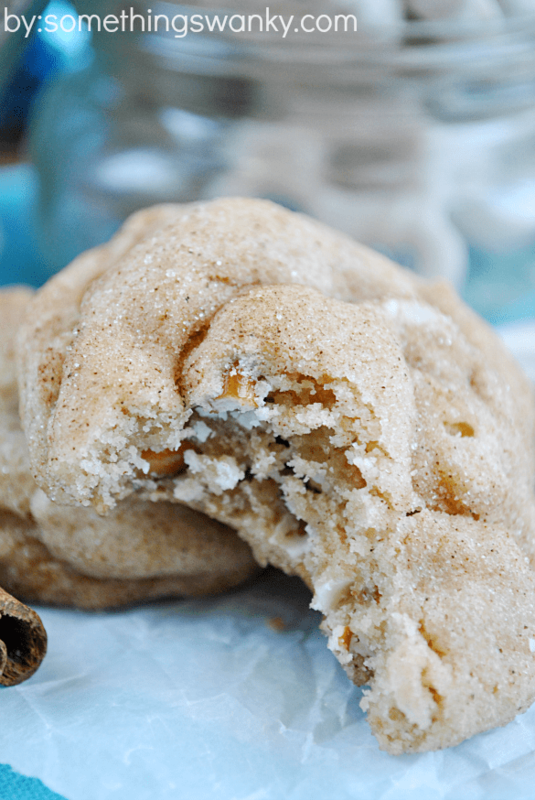 These White Chocolate Snickedoodle Pudding Cookies have a been a huge hit (both on the blog and in my house) since I first posted them almost a year ago! Everybody loves how soft and chewy they are on the inside, how crisp and buttery the edges are, and the bursting white chocolate and cinnamon flavors! Originally posted in August 2012. Photos, recipe, and some text edited July 2013. Given my fanatical obsession with all things involving sugar, you’d think I would have been all over this crazy Pudding Cookie recipe that’s been trending this year. But, truth be told, this is the first pudding cookie recipe I’ve tried! And I’m happy to report: not disappointed. I decided to make a white chocolate snickerdoodle version, being that it’s one of my favorite cookie flavors (second only to a good classic chocolate chip cookie). Dissolve the baking soda in the tablespoon of water. Add both the baking soda and the vanilla to the mixer and mix well. Mix in the salt and cinnamon. Add the flour and pudding mix, and mix until dough forms. 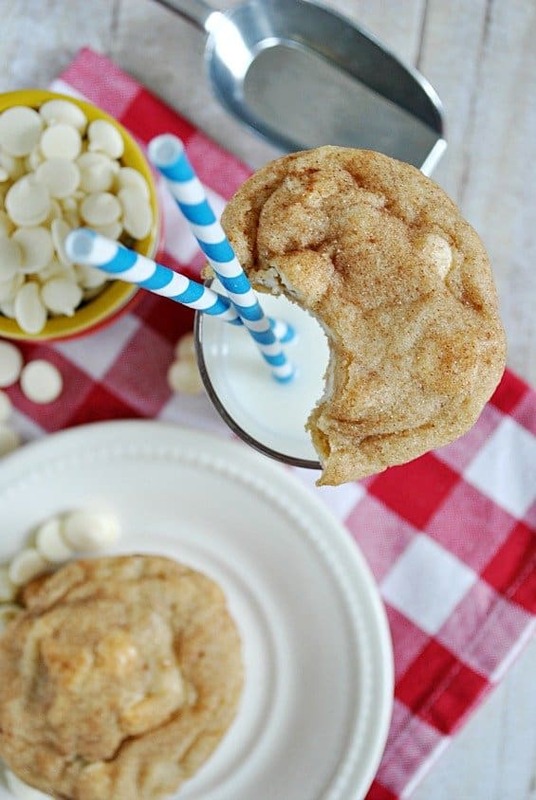 Mix in the white chocolate chips using a wooden spoon or spatula. Scoop dough by heaping tablespoons and roll in the cinnamon sugar before placing onto a parchment lined or silicon lined baking sheet, 2 inches apart. Store in an airtight container once completely cooled. Makes approximately 48 cookies. *It's important that the butter is still a little cold and not room temperature, otherwise the cookies will spread too much. Leave it on the counter for about 30 minutes, and it will be perfect. My mom and I have recently discovered the “pudding” cookies, and I have to say that this one is my absolute favorite so far! I can’t beleive a simple recipe like this has been around all this time and I’ve never heard of it! 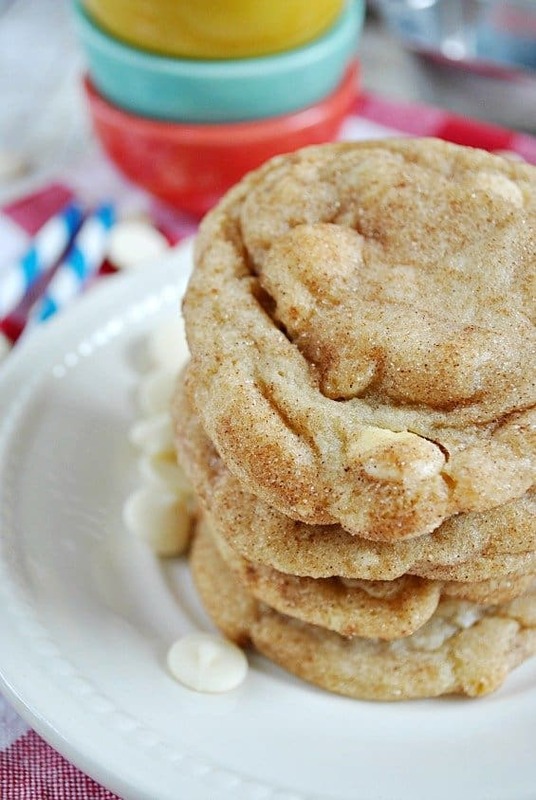 For this one, I used half white chocolate chips & half cinnamon chips – It was perfect! Thank you! Just to make sure, I put 3 packages of pudding mix in, right? Also, can I use a hand mixer instead? I don’t have a stand mixer. This recipe looks delicious!! No, I’m sorry for the confusion. You use ONE 3.4 ounce package of pudding mix (that’s the smaller box). Can you tell me what the yield is on this? I am needing a certain amount and am unsure of how large/small to make the dough balls and/or should I double the recipe. Thanks! We are having a ice storm here in Iowa so it was a perfect day to make cookies…these are the cookies I choose. So so good! I will make again! These look delish! I’m using colored sugar to roll in so they can be “king cake” cookies, so much more parade-friendly than a huge cake. I just made these, and I have to say that they are so easy to make and absolutely delicious! Thanks for sharing the recipe! I don’t know! Maybe it’s worth a try? Do these come out crunchy or soft? I’m a soft cookie lover myself. These look absolutely delicious! I showed the picture to my husband, and have now been requested to make these which I am not sad about at all!! Question: I only have a hand mixer. Do you think these will still turn out as delicious? I made these last night and they were fantastic! My husband has officially named these his favorite dessert! Thanks so much for the post! Made these the other night and they were absolutely delicious! So warm and they are still so chewy and yummy! A keeper for sure! I just finished making these! I used vanilla flavored pudding. The dough was very stiff, perfect for rolling into balls. They are very tasty! I can only find jello instant pudding in a box that is 1.5 oz or the smaller version which is 1 oz. where do you find a 3.4 oz box or should I use 2 of the 1.5 oz boxes and 1/2 of a 1 oz box? They are super yummy. However, they didn’t spread very much, so I had to pat them down before baking them. I also used 3 1oz packages of the instant pudding mix because my grocery store didn’t have the 3.4oz box, but they came out well. These look fantastic. I can’t wait to make them. One question, can the pudding be a sugar free mix, or should it be a regular pudding? Thanks! I printed this recipe off right away as it reminds me of them I was a little girl and my mom made snicker-doodles for us kids. I made these with sugar free pudding mix because my grocery store didn’t have the regular white chocolate instant pudding mix and they still turned out AMAZING!!! Love this recipe so much! Thanks! I can’t wait to make these cookies. I have yet to make cookies with pudding. This may be the start of something delicious in my house. OMG. I just made these… and had to comment and tell you how AMAZING they are! 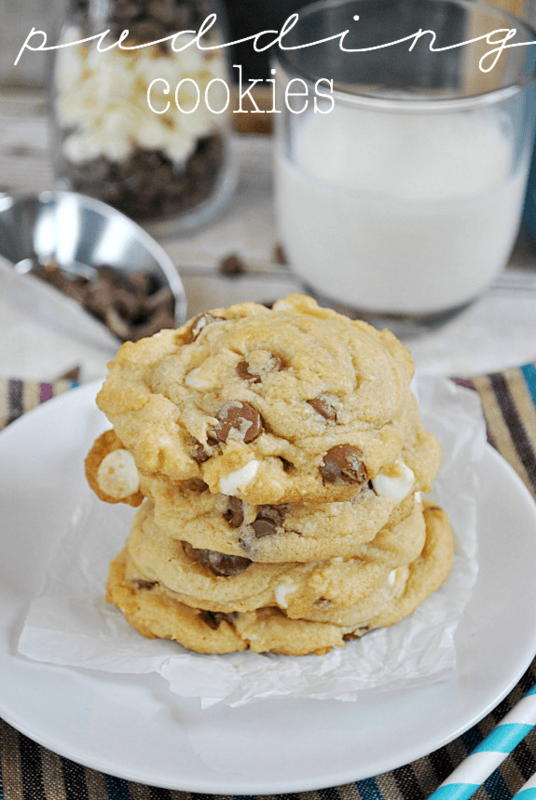 My favorite cookies I have ever made… cant wait to try more of your recipes. They are right up my alley. Thanks! I just finished baking these cookies. They are delicious! I used my Pampered Chef large cookie scoop and yielded 3 dozen cookies. I also skipped using the parchment paper. I put the dough right on my cookie sheets (no cooking spray was used either). They came right off with no problem. I baked mine for 12 minutes. Also wanted to ask, what is your cinnamon sugar recipe? I used McCormick’s pre-made cinnamon sugar, but my cookies look darker than yours. I am guessing McCormick’s uses more cinnamon. I made these recently and they were SO DELICIOUS I had to blog about them – and white chocolate usually isn’t my thing. 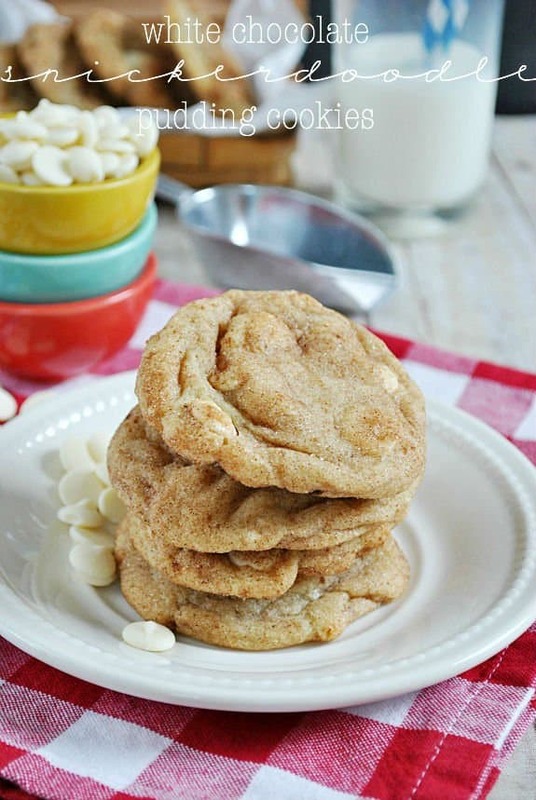 http://hungryredhead.com/2013/07/10/white-chocolate-snickerdoodles/ They got rave reviews and were gone quick. But I did stash a little dough away in the freezer for when I need a warm cookie fix :) Thank you so much for sharing this recipe! So glad you like them! They’ve been a hit, for sure! Hi! Just wondering if the pre-update recipe is still available somewhere? ,y sister and I made these in early July (and then again after the update), and decided we liked the first way best! I can’t remember the exact differences though. Thanks! I don’t buy shortening (rarely use it). Can I use 1 cup butter instead 1/2 cup butter and 1/2 cup shortening? Is it possible to use all butter instead of shortening? I made the snickerdoodle white chocolate pudding cookies tonight. Mine turned out really flat followed the directions to the T. Even try chilling the dough for a few hours. I live in Florida so it’s not a altitude problem. What did I do wrong. They still taste grate flat. I’m not sure what went wrong for you. I would have especially thought chilling the dough wouldn’t have allowed for any flat cookies! I know I had a flat cookie problem when I used to use margarine or other butter substitutes. Was your butter real, dairy butter? Not Blue Bonnet or some other form of margarine? I know people confuse those sometimes. I have made these several times over the last few months; they are my husbands absolute favorite. The last few times I’ve made them they have ended up flat, but still very tasty. Have you changed anything in the ingredients? Try not dissolving the baking soda, maybe that’s it for you? Actually, my sister and I have been trying to replicate the pre-July update version of the recipe. We can’t figure out exactly what changed, but we enjoyed the original versions taste much more. Is there any way we can find the original version on the site? Thanks! I just made these and mine are really flat too! I even chilled the dough overnight and baked them straight out of the fridge. My best guess is that I just overworked the dough, I doubt it’s a butter for me problem at all. But, flat or not, they taste super yummy and I will be making them again and again until I get it right! 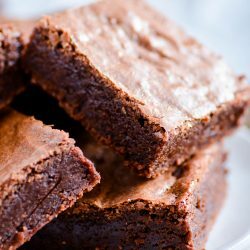 Is there anything that should be adjusted for high altitude baking? These might just be the best cookies I have ever had! I followed the recipe exactly and they were AWESOME! I saw someone commented about half white chocolate/half cinnamon chips, That’s a great idea. I might try that next time I make these. Recently, I’ve been using the Hershey’s brand of pudding mix– they have a white chocolate flavor. You may have missed it since it’s not always with the Jell-O brand mixes! And the packaging it different– I always have to search for it on the shelf, because my eye misses it since it doesn’t look like Jell-O! These cookies are amazing! Thanks so much for this recipe. I have also used this recipe as a template and made chocolate, snicker bar cookies and double butterscotch cookies. The possibilities are endless. Thanks again! Can you make the dough ahead of time? It’s Monday and I have a party on Sunday. How early can I make the dough and can I keep it in the fridge or freezer for a few days? I’m planning on making up the dough today but not cooking them until tmrw- is that going to be ok? I wasn’t sure if there would be any issue with chilling the dough overnight because of the pudding. Thanks!!! That will be fine, but be sure to bring the dough back to to room temp before baking. 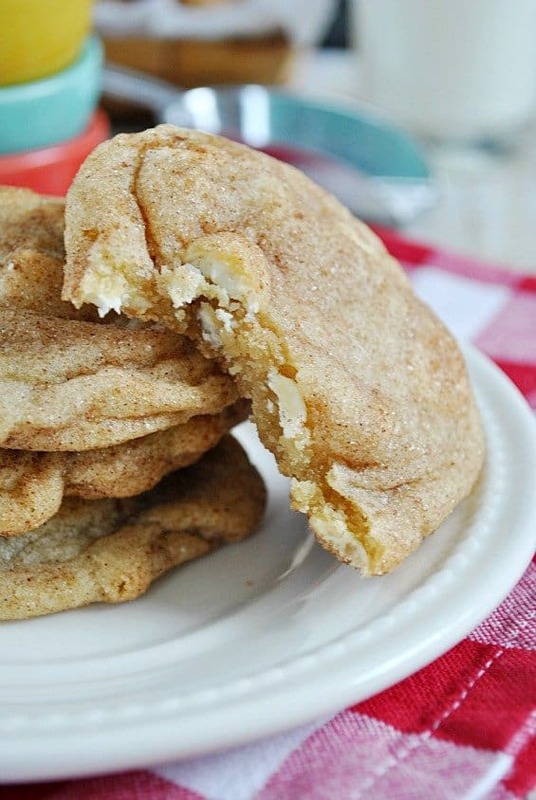 Just made these and they are the best snickerdoodle cookies. Just to help some people out – I could only find the sugar free 1 oz box of white chocolate instant pudding at the grocery store and the cookies taste great! Thanks for the recipe and happy baking!! These cookies are SOOOOOO yummy. Making these for the teachers at school on conference night – thanks for the recipe – I will tell them where to find it because I am sure someone will ask!